Imagine building a house when you're young that you can live in as you age: wide doorways can accommodate both a stroller and a wheelchair; towel racks in the kitchen double as grab bars as balance grows unsteady; and entryways are smooth to prevent tripping. Builders incorporate these concepts of universal design to create homes that are barrier-free without looking purposely modified. Baby boomers focused on aging-related changes while renovating their master bathrooms are shifting their bathroom layouts more often (47 percent) than boomers not addressing aging-related needs (35 percent of whom are or were making layout changes). Boomers focused on aging needs are also choosing more accessibility features for their bathroom remodels. The bathroom in this photo has multiple aging-related features (curbless shower, bench seat, grab bar). It also could accommodate a wheelchair; there is room for one beneath the sink and also at the vanity on the back wall. 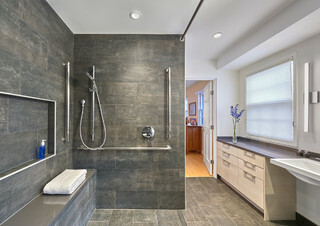 Baby boomers addressing aging-related changes while renovating their master bathrooms are more likely to install shower features such as a shower seat, a low shower curb or no curb, and grab bars, compared to boomers who are not focused on aging.